Honda Addresses Shock Failure At Motocross Of Nations – The Honda factory motocross team addressed the shock failure issue that caused Cole Seely to DNF both of his motos at last weekend’s Motocross of Nations at Matterley Basin in Great Britain. 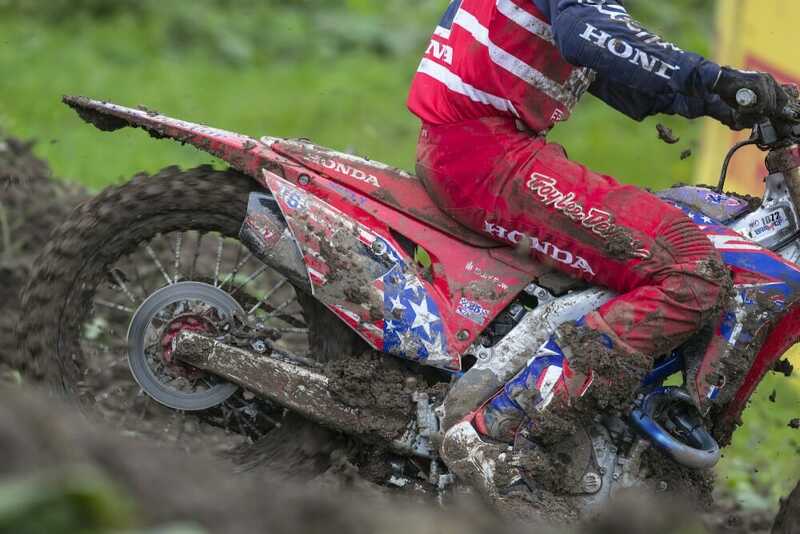 Team Honda HRC today confirmed that the double DNFs by Cole Seely during the Motocross of Nations at Matterley Basin in Winchester, England, last Sunday were caused by identical shock-absorber failures on his CRF450R. Seely was forced to withdraw from the muddy first and third motos after the spring holder on his factory KYB shock became dislodged, allowing the spring to drop. KYB would also like to acknowledge the impact the failure had on the U.S. effort and offer their apologies to the MX community. Countermeasures and design updates are currently being instituted to insure this type of situation does not happen again. KYB adds that only factory KYB-issued parts for HRC factory bikes and race teams are affected. Click here for more motocross and supercross news.